A Telford-based precast concrete specialist is celebrating success after responding to an urgent client enquiry in record time, and preventing nuisance travellers setting up camp on Halesfield 19 Business Park in Telford. 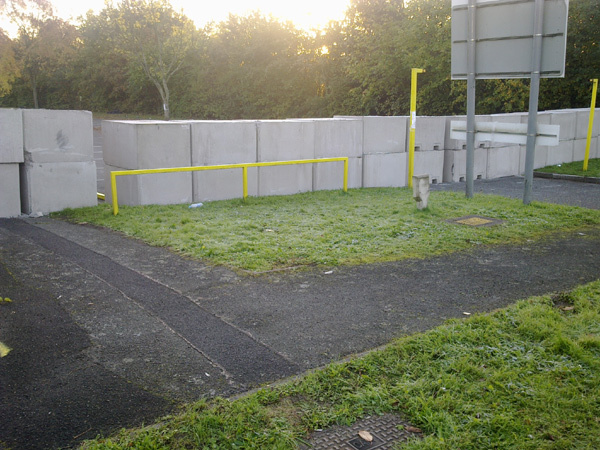 Elite Precast Concrete, who produce a variety of innovative precast concrete solutions for clients UK-wide, were called upon by a concerned business owner on the park to provide 28 two-tonne security barrier blocks, following reports that travellers had homed in on a nearby industrial site and caused thousands of pounds worth of damage. Owen Batham, Sales and Marketing Director at Elite Precast Concrete, said: “We were contacted early yesterday morning [Tuesday 29 October] by a Telford business owner who was concerned after last week’s injunction saw the travellers begrudgingly on the move. We had a two-hour window to get the blocks delivered to Halesfield 19 and close off a large staff car park. I wonder if they could do this at Snedshill. That would be great! My thought is that their reputation, for whatever reasons, goes before them. We went shopping at Aldi in Madeley last weekend after the travellers had been moved on. The sacks of rubbish waiting to be taken away after the clean-up operation spoke for themselves.